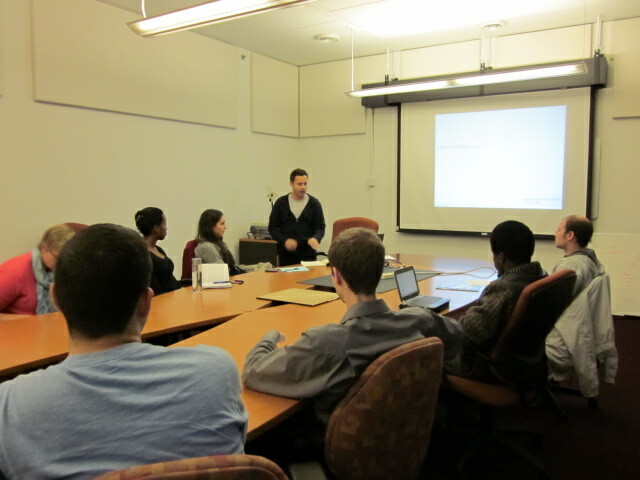 On Monday night, Harley Finkelstein visited the University of Ottawa to present “The DNA of an Entrepreneur”, to student entrepreneurs vying for $20,000 and entry into the 2012 Start-up Garage. Finkelstein commented on the make-up of entrepreneurs and their success. He also used his first hand experience as an executive at Shopify to highlight the potential behind “Software as a service” as a compelling model for delivering value to clients in the software sector today. At the age of 27, Harley Finkelstein is well on his way to achieving his goal of making Shopify a billion dollar company. He believes that being an entrepreneur is the best job in the world, and that there is no better time to start that job than in your twenties. This is when individuals have the greatest freedom to take risks, one of his key success factors in becoming an entrepreneur. The over 30 students attending could not help but find inspiration through Harley’s youthful and captivating success story built on a decade of being an entrepreneur. shouldn’t be missed by young entrepreneurs and alike. Lundi soir dernier, Harley Finkelstein a visité l’Université d’Ottawa pour présenter « The DNA of an Entrepreneur », une présentation visée aux entrepreneurs étudiants en lice pour 20 000 $ et l’entrée dans le programme Start-up Garage 2012. Finkelstein a commenté sur l’identité de l’entrepreneur et de certains facteurs contribuant à leur réussite. Il a également utilisé son expérience personnelle, en tant que membre exécutif de Shopify, pour mettre en évidence le potentiel derrière les « logiciels comme service », un modèle convaincant pour offrir de la valeur aux clients dans le secteur des logiciels aujourd’hui. A l’âge de 27 ans, Harley Finkelstein est bien équipé pour atteindre son objectif pour faire de Shopify une entreprise valant des milliards de dollars. Il croit qu’être entrepreneur est le plus beau métier du monde, et que le meilleur moment pour s’y lancer est durant ses vingtaines. C’est un moment ou les individus ont la plus grande liberté de prendre des risques, l’un de ses facteurs clés pour avoir du succès comme entrepreneur. Les 30 étudiants qui ont fréquenté la session d’information n’ont pas pu s’empêcher d’être inspirés par l’histoire de Harley. Son caractère jeune et passionné lui a bien servi. Start-up Garage sera l’hôte d’un autre évènement le 9 novembre 2011. Présenté par Trevor Wilkins sera une présentation intitulé Turning Selling into Buying® – words, actions and insights that lead people to buy from you. Les étudiants (e)s intéressés à l’entreprenariat ne devraient pas manquer cette session. OTTN – and the University of Ottawa – are pleased to have three new technology transfer managers with experience at other institutions, join the OTTN team over the past two months. You may have already met, or may already know some of them, but we encourage you to interact with our newest team members. Perry M. Kim, PhD, Perry.Kim@uottawa.ca has over 20 yrs of research experience and over a decade of business experience. He was recently Chief Operating Officer for a small pharmaceutical company developing agents for the treatment of heart disease. Previous to this, Dr. Kim held the position of Director of Commercial Development at PARTEQ Innovations, the technology transfer arm of Queen’s University. Dr. Kim was an assistant professor in the Dept. of Pharmacology and Toxicology and the School of Environmental Studies at Queen’s University and continues to hold an adjunct position with both departments. François Nadeau Eng., MBA fnadeau@uottawa.ca has a professional background in both engineering and business (and holds an MBA and a Diploma in International Commerce). This has led François to work on projects in both local and international markets (USA, Europe), spanning from local university networks as technology transfer officer at Université du Québec en Outaouais to signing multi-million dollar deals with aerospace companies. With over 20 years of experience, François has experience in telecommunications, IT, sensors, optics and photonics, transport, as well as advanced technologies. He worked as project manager in product development, and has coached over 25 start-up companies, and has been responsible for portfolio investments amounting to $18M. Catherine Geci M.Sc. LL.B. cgeci@uottawa.ca is responsible for evaluating the commercial potential of new technologies arising from life sciences research at the University and at OHRI. Catherine is responsible for developing strategies for commercializing technologies, negotiating licenses and other commercial agreements, and facilitating industry engagement with researchers. Catherine holds a Master of Science from McGill University and an LL.B. from the Université de Montréal. She was called to the Quebec Bar in 2006. Prior to joining the University of Ottawa, Catherine held positions as a lawyer and patent agent trainee at a Montreal-based firm, and as a technology transfer manager at the University of Guelph. These three additions to the OTTN team will add domain expertise in life sciences and engineering and support activities at the University of Ottawa, OHRI, CHEO and the University of Ottawa Heart Institute. They join other OTTN team members, Sean Flanigan, Mark Pearson Brian Julien, Anouk Fortin (OHRI) and Joe Irvine. Financial support for these positions comes from the OCE Technology Transfer Network, the University of Ottawa and OHRI and all three positions are also part of the Rideau Commercialization Network. On October 24th, Harley Finkelstein will share his perspective on what it takes to be a successful entrepreneur. Currently an executive at Shopify – an oline store platform – and having founded one of Canada’s leading promotional apparel companies, Finkelstein will explain the distinction between good and great business ideas. Come out to join Finkelstein and the Start-Up Garage team for an interesting discussion on “The DNA of an entrepreneur”. For a free registration, click here. The Technology Transfer and Business Enterprise (TTBE) office of the University of Ottawa is gearing up for its second “Breakfast Seminar”. A free event, registration to the seminar starts today until October 31st. Click here for registration information. Healthcare is now the largest single item in government expenditures and plays an important role in our country and our community. There are both challenges and opportunities related to the use of information technology in healthcare. These provide new opportunities for research, for careers, for new products and for entrepreneurship that will impact uOttawa, our hospitals and our students. *The speakers will participate in a question and answer session at the end of the presentations, moderated by Dr. Jom Aw, PhD, MBA, Founder and CEO of Strategyx Inc, and Biosciences Entrepreneur-in-Residence.